Situated not far from Aurangabad city in Maharashtra region the prominent Ajanta & Ellora caves still remain the remarkable attraction of ancient Indian architecture and art. 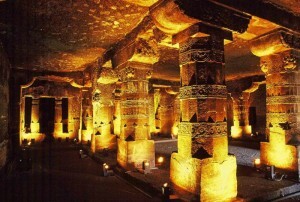 This is a certain combination of nature caves and shrines that were manually cut out of rock. This marvelous heritage of ancient Indian culture and beliefs was discovered in 1819 by a British Army Officer called John Smith while being on the hunting expedition. The sightseeing consists of 34 Ellora caves and 29 Ajanta caves which also have wall paintings illustrating ancient gods, people and hunting scenes. The Ajants caves mainly depict the story of Buddhism and were built for Buddhist monks as a shelter or a place for meditation. 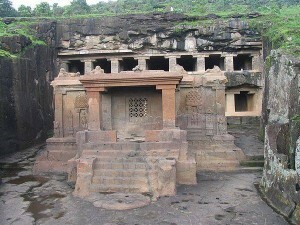 They are shaped in the special form which resembles a horseshoe and the Wagura River forms a waterfall above the caves. Buddha’s life and his incarnations are the key topics of the inner sculptures and paintings. Here one can also find illustrations of the common people, beautiful women, small children, people’s hairstyles, jewelry, clothes, etc. All the paintings are made with the tempera technique which is usually done on a dry surface after the certain mixture coating made of cow dung, clay, rice husk and some other unknown components. The color used for the paintings was always made from natural components. Best wall pictures one can see in the cave №1 where the depiction of the former Indian society is located. It’s possible to find here all classes: from kings to simple men or even slaves. The life of people in those ancient times was closely connected with nature, that’s why in the pictures there are also lots of plants, beasts and birds. In the second cave it’s possible to see the depiction of famous Jataka tales which reflect ancient beliefs and imagination. Cave №16 is famous for the decorative murals. In the cave №17 the images of the preaching Buddha with the flying Apsara painting are depicted. The Ellora caves were being constructed from the 5th till the 10th century and combine architecture with art of three major religions: Jainism, Hinduism and Buddhism. Out of the 34 caves the first 12 belong to the Buddhist art, the next 17 are Hindu caves (up to №29) and last 4 caves belong to Jain philosophy. 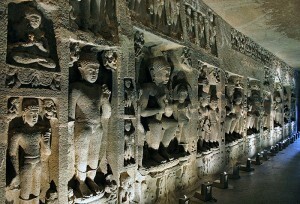 The inner world of all the caves provides peaceful and unique atmosphere that shows the powerful force of ancient Indian gods. While visiting the Ellora sightseeing don’t miss cave №16 where the Kailasa Temple is located. Being one the largest monolithic Indian structure and built in honor of Lord Shiva it impresses every tourist by the uniqueness, grace and huge proportions. The structure of the Temple consists of gateway, assembly hall, pavilion, sanctum and tower which are carved out of a single rock. 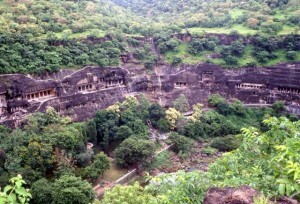 Still caves in the Ajanta & Ellora complex are unique and worth seeing because they illustrate not only ancient art and architecture but the whole Indian mentality and lifestyle. That’s why if you really want to see incredible and unforgettable India just visit Ajanta & Ellora caves.